Have you been struggling to rank your web pages organically, even after precisely targeting the most potential keywords? If yes, then you need to focus on targeting long tail keywords. Long tail keywords are the extended version of your target keyword, which clear the user intent more precisely. 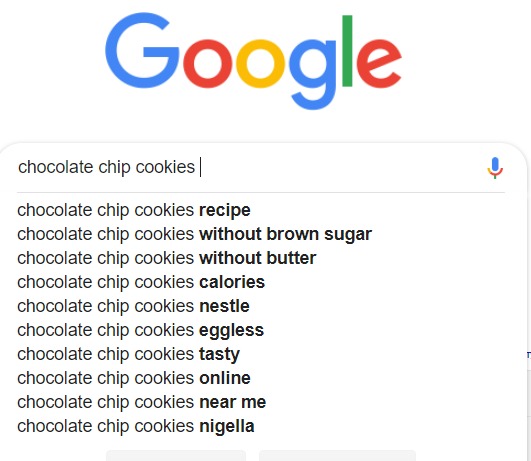 For instance, if you own a cookie-selling business, your target audience is most likely to find your business by searching for “cookies”. However, considering its keyword difficulty, it would be quite strenuous for you to rank for it, especially if you’re a small business or have recently launched your website. 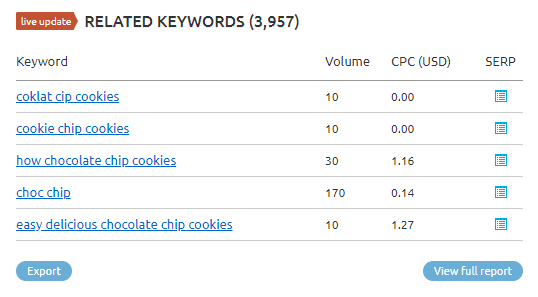 This is when a more specific and intent-oriented keyword like “buy chocolate chip cookies” would be more beneficial to target and easier to rank for. Even though this keyword has very low search volume, its keyword difficulty is extremely low as well. 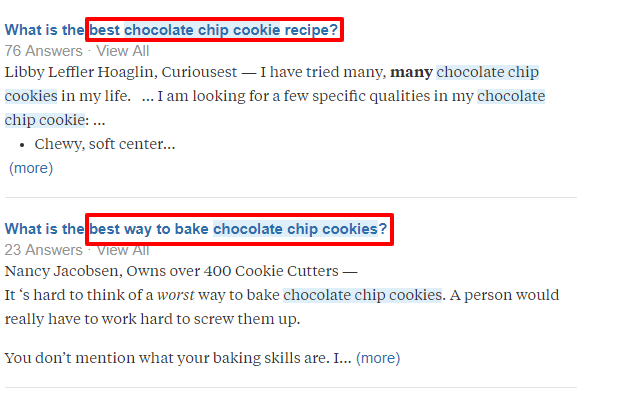 It means that ranking for “buy chocolate chip cookies” would be much easier than a competitive keyword like “cookie”. In fact, if you use the right SEO tactics, you can easily rank for all the 60 search volumes and easily increase website traffic to your website. 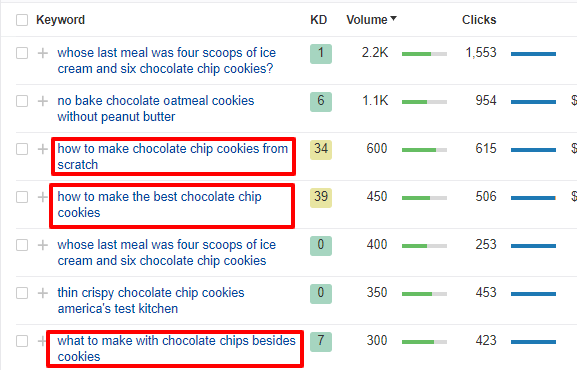 So, as you can see that “buy chocolate chip cookies” is the extended version and a long tail keyword for the head keyword “cookie”. Similarly, you can also find long tail keywords in your business niche and improve your organic rankings by precisely infusing them in your content. 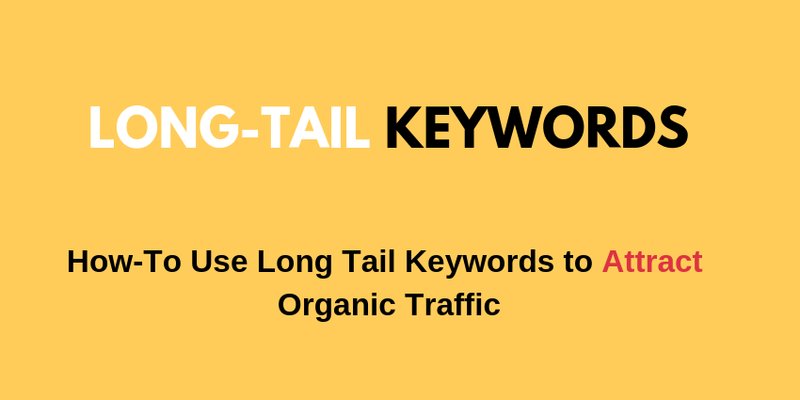 So, in this blog post, we have decided to scribble down everything you should know about long tail keywords and how they can help you improve organic traffic. Phrases which contain more than two words and are the extended version of the head keyword. They are more specific than the head keyword and are extremely specific. As a result, they help you attract qualified organic traffic which is more likely to convert in the future. Now, that you know what long-tail keywords are, it’s time to understand the importance of targeting them. As we mentioned earlier, long-tail keywords are less competitive than your regular head keywords. Having a low difficulty means that it is way easier to rank for them and drive more committed traffic at the same time. 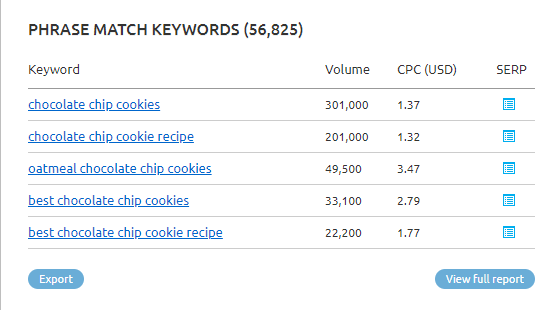 For instance, the head keyword “cookie” (mentioned in the above example) had a keyword difficulty of 37 and a search volume of 211,000/month. 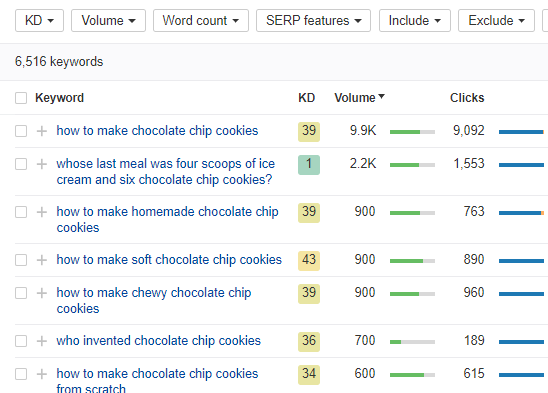 However, the KD for its long-tail keyword (chocolate chip cookie) got reduced to 3 (fairly easy to rank for) with a search volume of 60/month. There are several ways using which you can find long-tail keywords in your niche. These methods include both research and the use of automated tools such as Ahrefs, SEMRush, Keyword Planner, etc. Here are some of the ways which you can use to find long-tail keywords. The first and most convenient way is to perform a Google search. Simply type in your target keyword into the search bar and hit enter. Now scroll down to the bottom of the SERP and take a look at the “Related Search” section. This is where you can find keywords which people are using to find your services/products. It is also worth noting that the relates search section can also be used to LSI keywords, which also have the potential to improve search engine rankings and drive organic traffic at the same time. Along with the related search section, you can also use Google autocomplete suggestions to find the frequently searched terms which contain your target keyword. Simply type in your target keyword into the Google search bar and wait for Google to dropdown the suggestions. Quora is the perfect platform to find the long tail keywords as well as content ideas for your businesses. Simply enter your target keyword in Quora’s search bar and hit enter. The above methods can be used to manually find long tail keywords. However, finding keywords manually can be time-consuming as you don’t know anything about the keyword such as its search volume and keyword difficulty. Therefore, it is recommended to directly use an automated tool to find the most potential long tail keywords for your business. Here are some of the automated tools which provide the most accurate results. Ahrefs is one of the most popular and widely use SEO tool. Having high accuracy and easy navigation, Ahrefs is the first preference of many SEO experts. Enter your head keyword in Ahrefs’ keyword explorer and add a search volume filter to find results which can considerably low search volume. The keywords, having low search volume, are more likely to be extremely specific. As you can see that the above snippet has more specific key phrases with comparatively low keyword difficulty. It means that it would be easier for you to rank for these keywords compared to achieving the same rankings for the head keyword. You can also set the word count filter to get more specific long-tail keywords. Simply set the word count filter to whichever word length you want the keyword to be and hit enter. Another way to find long tail keywords using Ahrefs is to click on the Question button in the left corner. This will display a list of questions people are asking on Google for the head keyword. These are a few of the methods which can be used to find long tail keywords using Ahrefs. Now, let’s take a look at some of the other automated tools which can be used as alternatives for Ahrefs. SEMRush is yet another commonly used SEO tool. However, apart from being an effective SEO tool, SEMRush can also be used to generate keyword reports and find long-tail keywords. Here’s a report that we generated using SEMRush and as you can see it displayed some of the best keyword ideas with considerable search volume. You can also generate the related keyword reports to find keyword ideas which relate to the head keyword and can be used to improve your search engine rankings. These are a few of the methods using which you can find long-tail keywords for your business niche. Now, let’s take a look at how you can infuse these long-tail keywords into your content and attain top rankings in SERP. How to Use Long Tail Keywords to Improve Your Search Engine Rankings? Using long-tail keywords to improve your search engine rankings has a lot to do with content marketing itself. If your content marketing game is not up to the mark, you’re less likely to attain top rankings, even by targeting the most potential long tail keywords. It means that you need to familiarize yourself with user intent before crafting content for the target long tail keyword. Google’s sole purpose is to provide users with highly accurate search results that resolve user queries. So, it is important that you create content which provides value to the customers. Here’s how you can infuse long-tail keywords in your content and optimize it to attain top rankings in SERP. Insert the keyword in your meta title (while keeping it natural) as well as the H1 tag. Precisely sprinkle the long tail keyword within the first 100 words of the blog. Do not use the exact keyword but try to use different variations of it as it increases the overall content credibility. Try to add the keyword to H2 posts throughout the post. While writing blog posts, however, try to keep them informative and as accurate as possible. Stuffing the long tail keyword can do more harm than good for your website, which you would not want at all. Maintain a natural flow throughout the blog post and precisely sprinkle the keywords so that your blogs do not lose content credibility at all. Now, that you know how to infuse long-tail keywords in your content, let’s compare the head keywords and long-tail phrases one more time and understand why they are better than regular head keywords. Head keywords are highly competitive. It means that ranking for them won’t be easy at all. In fact, the truth is the majority of high authority domains are already ranking for the head keywords and there’s no way you can outrank them, even if you utilize the best SEO strategies. Now, considering the high domain authority of these three websites, it would be next to impossible to outrank them. This is one of the reasons why it’s always advised to prefer long-tail keywords overhead keywords. Unlike head keywords, you don’t target a broad audience with long-tail keywords. Instead, you target people who are more likely to avail your services or buy your products. This is extremely beneficial, especially for small businesses as they can attract the most potential organic traffic to their website. The odds for a user to convert are comparatively more when he’s being attracted via a long-tail keyword. Long-tail keywords have a huge potential to help you drive organic traffic to your website. If you aren’t using long-tail keywords as a part of your content marketing strategy, you’re missing out on big traffic opportunities. The benefits of using these keywords are endless and that’s why it should be a part of your content marketing. Hire a team from SEO Company India to get the best results by targeting the most suitable long tail keywords, which your target audience use more frequently.